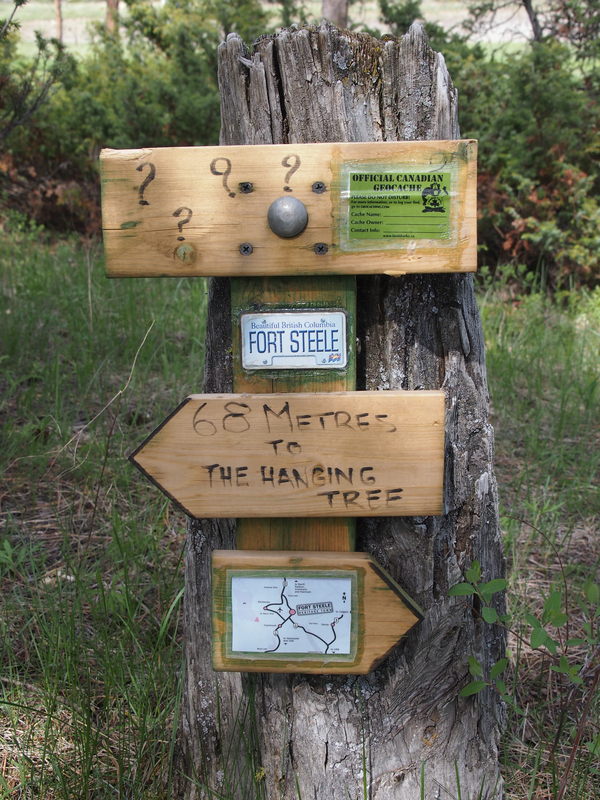 In both 2009 and 2010, I drove to Fort Steele when I volunteered to accompany a school trip but I didn’t do any geocaching along the way. 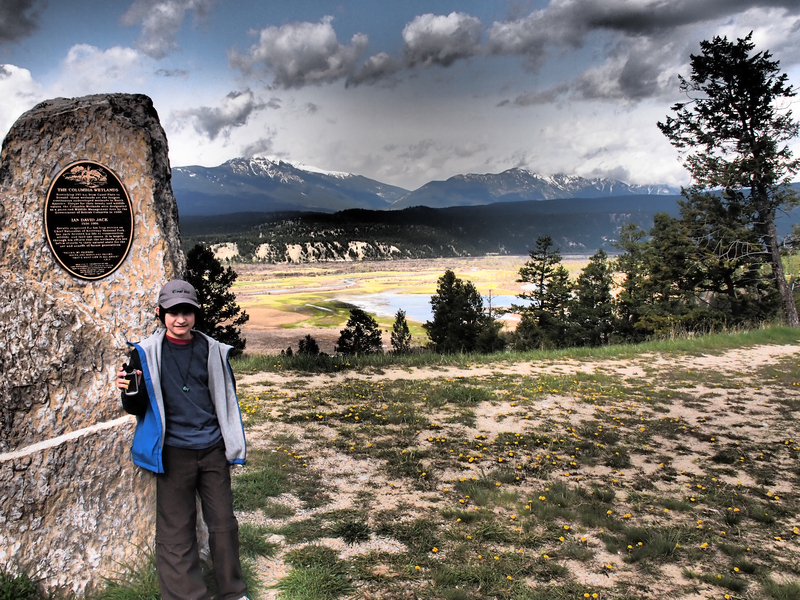 This year, after volunteering for the third (and final) time, K and I decided to drive to Canmore a day early and then leave for Fort Steele the next morning at the same time the bus would be departing Calgary, giving us about an hour for geocaching along the way. Departing Canmore on May 9th via the TransCanada Highway through Banff, we turned south west onto Highway 93 at Castle Junction where we spotted a rainbow against the backdrop of snowcapped mountains. Our first geocaching stop was at BCP507, a location for one of our all-time favourite caches, GC43F3 – Brass Cap Cache (read more in this earlier post). 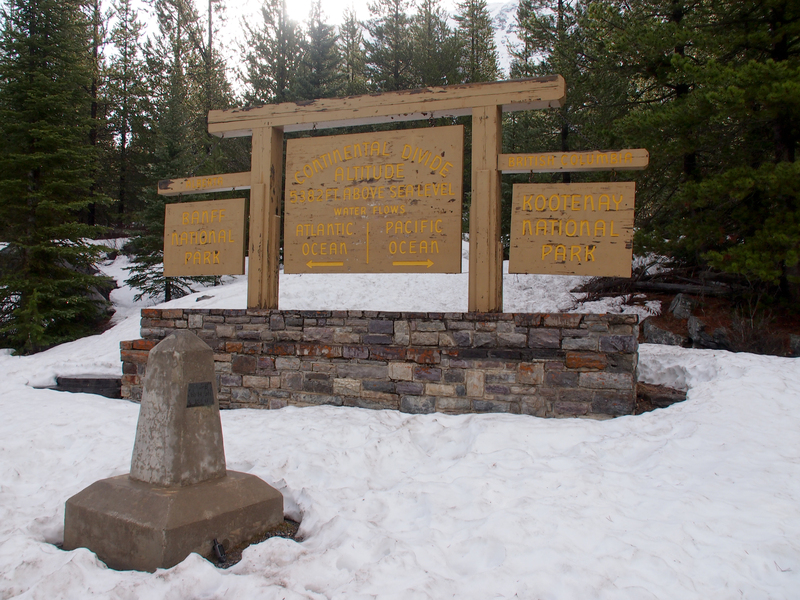 Although there were still traces of snow at the roadside rest stop located on the continental divide, the survey monument was easy to locate and we took a few minutes to read about the history of Vermillion Pass. The signs are significantly weathered, most likely a result of the on-going cuts to Parks Canada’s budget. This particular location of GC43F3 (Brass Cap Cache) is on the Continental Divide, which also happens to be the Alberta / BC border. 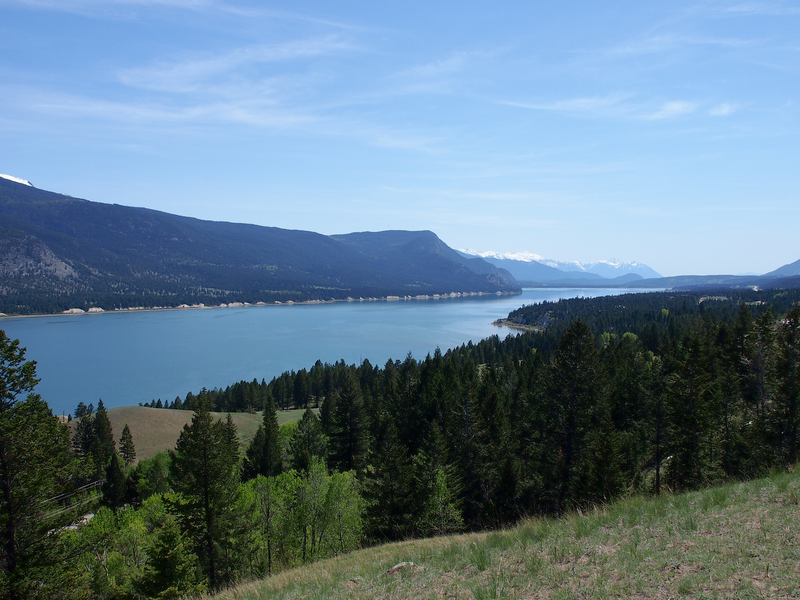 We stopped twice more before reaching our final destination – Fort Steele, a heritage town in the East Kootenay region of British Columbia. K hopped out of the vehicle to help collect the required information for each of the earthcaches and also posed for the requisite “photo with GPSr”. Our timing was great; we arrived about 5 minutes before the charter bus loaded with 49 grade 5 and 7 students, teachers and additional parent volunteers. 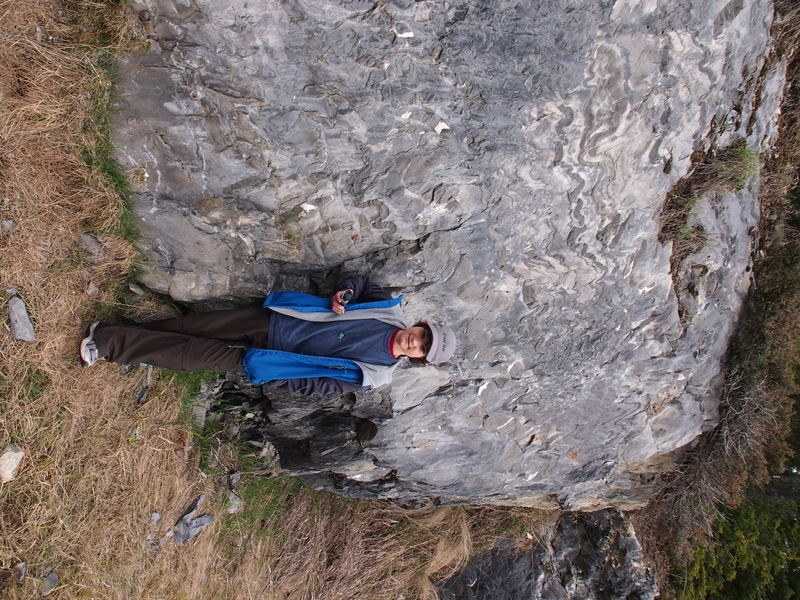 K holds the GPSr at the location of the Disharmonic Folds earthcache along Highway 93 between Castle Junction and Radium. Although he patiently helped with the measurements, he was more interested in the little creek just south west of the rock formation. K was ready to hop out and stretch his legs for a few minutes by the time we arrived the Columbia Wetlands earthcache and he was a good sport about posing for the required photograph. While at Fort Steele for the next few days, I managed to get a few breaks from my supervisory / labourer roles. I spent some time getting familiar with my new (to me) Olympus E-P3 and also managed to squeeze in a bit of geocaching. The first evening, while the kids were playing pioneer games, I talked one of the other parents into joining me for the short walk to the nearby pioneer cemetery to search for GC1QRPV Putrid and Malignant Fever multi-cache. Who can resist a cache with such a descriptive name (especially after contacting the cache owner the week previous to ask if there was any chance he could perform maintenance and re-enable the cache for me)! We successfully earned a smiley for this one, which was particularly satisfying given my DNF earlier in the day on a cache hidden within Fort Steele. 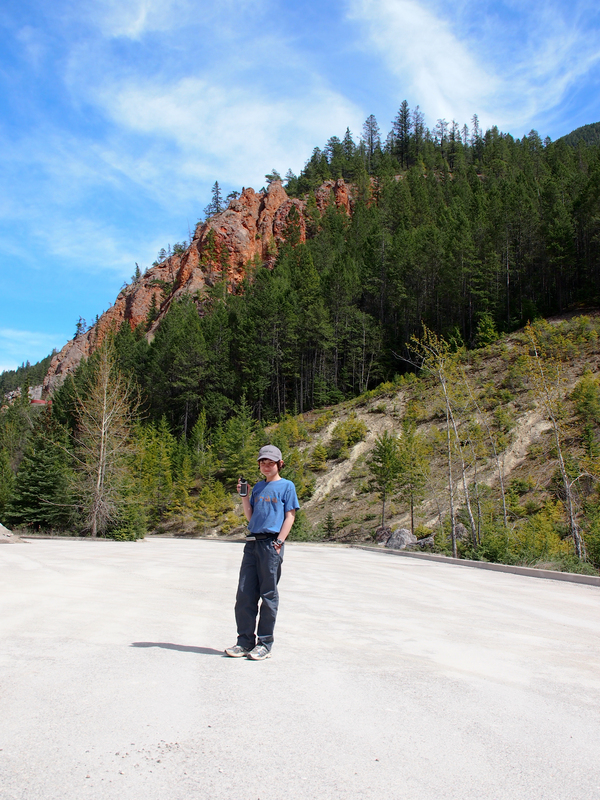 The Redwall Fault earthcache was our last scheduled stop on our return drive from Fort Steele to Canmore. K posed for the obligatory photo and we were fortunate the parking area was empty and we didn’t have to worry about dodging moving vehicles while we derived the answer to the logging requirement. I haven’t found the time to log any of these caches just yet, but will get around to it in the next couple of days. I enjoyed squeezing in a bit of geocaching between visits to the tinsmith, the blacksmith, the railway station, learning old-fashioned surveying techniques and more. I also managed to take enough good photos to complete a “12 of 12” photo set for May and to complete my Quotography collaboration assignment. 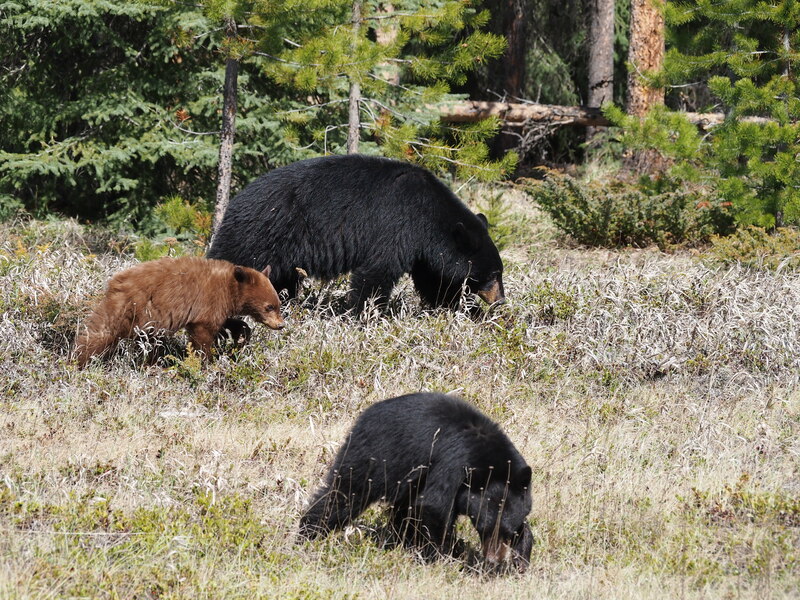 The perfect ending to our trip was sighting a mother black bear and two cubs just off Highway 93 on our way back home – a natural treasure!